The streets are known by such queer names, they’d surely make a rhyme. For where there’s smoke there’s money, in a place like this, you know. And of our city’s outskirts, true, the half has not been told. Right in the centre of the town, you find a Paradise. Soon after leaving Paradise, you go to Jericho. And Hoyle Street, little Bethel too – an ecclesiastic ward. You reach a bonny Meadow Street; where can the sheep be found? You’ll reach the old Fire Station at the end of Westbar Green. Right in the very midst of them, a Silver Street is found. Where once you saw the Baptist Church, there’s a social club instead. And the fame of Whirlow Hospital, in Hollis Croft was laid. But you’d seek in vain down old Corn Hill for barley, oats or wheat. And Daisy Walk a pleasant path was where the children played. But do be careful if you seek the charms of Sambourne Square! And the old Pea Croft allotments, sure you’d find them hard to beat. T’was followed by a Ragged School, till Board and Council came. From teacher to Conductor, he’s made a world-wide name. ‘Twas followed by a Clinic and the flats appeared all round. Not least is old friend Abraham, at the Head of Silver Street. Ye’ll still find rare old bargains if ye find nae purple heather. But if the day is bleak and cold, well, go down Furnace Hill. Although you’re not in sunny Spain, you’ll be in old Gibraltar. Up Watery Street you cannot miss – they call it Portmahon. You’ll soon arrive in old Love Lane where no doubt we all have been. They’d roam along the old Pye-bank and cross the great Pits-moor. Enchantment find at eventide, in the cool of Moonshine Lane. And wander through the old Firth Park towards their cottage home. And fisherman upon the banks would sit and dream and dream! Fore the strangest sight in Neepsend is a Harvest Lane in winter. There’s Corn Exchange throughout the year, and an old Sheaf Market there. For here the inland ‘retinue’ can spot you to a farthing. There’s infinite variety, and entertainment free. And oh, those rows of cocoa-nuts – so tantalising too. And then again those cocoa-nuts, you shied them one-two-three. But barges on the old canal go proudly sailing on. Our boat is on the Grand Canal, you’d better just drop in. See Vickers’, Cammell’s, Firth’s and Brown’s and other works we know. Our cutlery has world-wide fame – no contradicting that! We’re travelling to a bright Brightside, and darkness flies away. However dull may be the day, they brighten up at night. Let’s ramble next to Meadow Hall, and on the wayside linger. You gaze upon a well-known bank and lo! it is the Wink(er)! Pass through the Wicker Arches, soon you reach the old Waingate. Just board a Sheffield City car, you’ll reach the Parish Church. But here our journey we must break, hark how the old bells chime! We’ll take some light refreshments and resume another time. And count the milestones on our way, as time goes fleeting on. We’ll take another tour some day for sake of Auld Lang Syne. 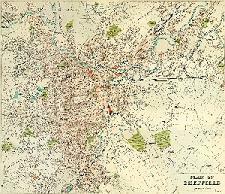 Sheffield Indexers collection of links to historical Sheffield including; Sheffield History, Laws & Acts, Living & Working Conditions, Historical Land & Buildings, Sheffield Flood and War Memories. Sheffield Indexers collection of links to more articles of interest relating to Sheffield including; Sheffield Stories, Newspaper Articles, Editorials & General Interests, Sheffield Rhymes Etc, Cherished Sheffield Family Memories, Recipes of Olde Yorkshire, Old Sheffield Picture Post Cards and Yorkshire Expressions.